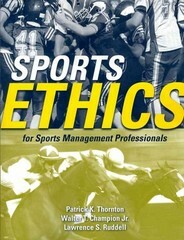 usforacle students can sell Sports Ethics for Sports Management Professionals (ISBN# 0763743844) written by Thornton, Patrick Thornton, Patrick K. Thornton, Walter T. Champion Jr., Walter Champion, Lawrence S. Ruddell, Larry Ruddell and receive a $23.35 check, along with a free pre-paid shipping label. Once you have sent in Sports Ethics for Sports Management Professionals (ISBN# 0763743844), your University of South Florida textbook will be processed and your $23.35 check will be sent out to you within a matter days. You can also sell other usforacle textbooks, published by Jones &Bartlett and written by Thornton, Patrick Thornton, Patrick K. Thornton, Walter T. Champion Jr., Walter Champion, Lawrence S. Ruddell, Larry Ruddell and receive checks.